WNS (Holdings) Limited, a leading provider of global Business Process Outsourcing (BPO) services, has been recognized by Institute Of Directors (IOD), with the Golden Peacock Global Award for Corporate Social Responsibility 2012. WNS has won this prestigious global award for its ongoing 'Community Development and Outreach Program,' under the auspices of the WNS Cares Foundation (WCF). WCF endeavors towards creating a better and sustainable future for underprivileged children and youth at WNS's locations across the globe. The award was presented to WNS in a gala award ceremony by His Excellency, Humaid Mohammed Obaid Al Qutami, Minister of Education, Government of UAE at the 7th International Conference on Social Responsibility held between April 24 and April 26, 2012, in Dubai. Keshav R. Murugesh, WNS's Group CEO, also participated in the summit as the Chair Person and chief moderator of the key note session on "Social Innovation -- The Driver of Economic Growth." WCF received this award for its noteworthy contribution towards the education of underprivileged children. Over 120 activities have been conducted by WCF in a short span of 14 months, helping more than 23,000 beneficiaries in 17 locations. Programs have included establishment of libraries & computer centers; book, dictionary and laptop donation drives; reading programs; sports activities, and mentoring programs. 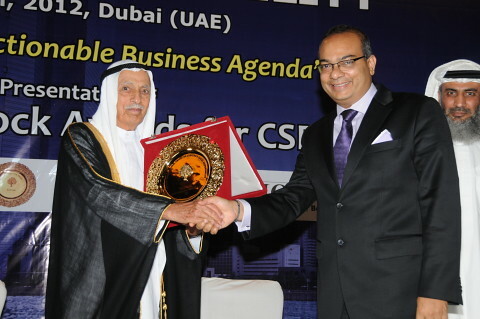 "We are pleased to announce that WNS is a winner of the Golden Peacock Global Award for Social Responsibility for 2011-2012. WNS was adjudged the winner of the Social Responsibility Global award for continuous and significant contribution through WCF towards education of underprivileged children," said Manoj K Raut, CEO and Director, Institute of Directors. "Congratulations to WNS and the WCF team for their commendable effort in supporting the less-privileged community," he added. "Winning this prestigious honor in the area of Corporate Social Responsibility is a matter of great pride for us," said Keshav R. Murugesh, Group CEO, WNS. "Since the inception of WCF in 2011, the entire WNS family has worked together as one team, towards achieving our mission to 'Educate Empower Enrich' underprivileged children and youth, as we strongly believe and understand the importance of knowledge and education in positively shaping the society around us. Every child has the right to education, and we at WNS will continue our efforts to make an impact in the communities in which we live and work." The Golden Peacock Awards (GPA) is a set of prestigious national and global awards designed to improve productivity and quality in organizations. The Golden Peacock Awards are now considered the greatest recognition of corporate excellence in areas of innovation, quality, training, governance, environment management and corporate social responsibility. The Golden Peacock Global Award for Corporate Social Responsibility are to stimulate and help organizations to rapidly accelerate the pace of stake-holder oriented improvement process. It is a powerful self-assessment process and a way to build an organizations' brand equity on 'Corporate Social Responsibility.' The preparation for the award helps to inspire and align the entire workforce and management functions to this end. The knowledge gained by the organization in describing and self-assessing its operations would lead to improved organizational performance in this field.